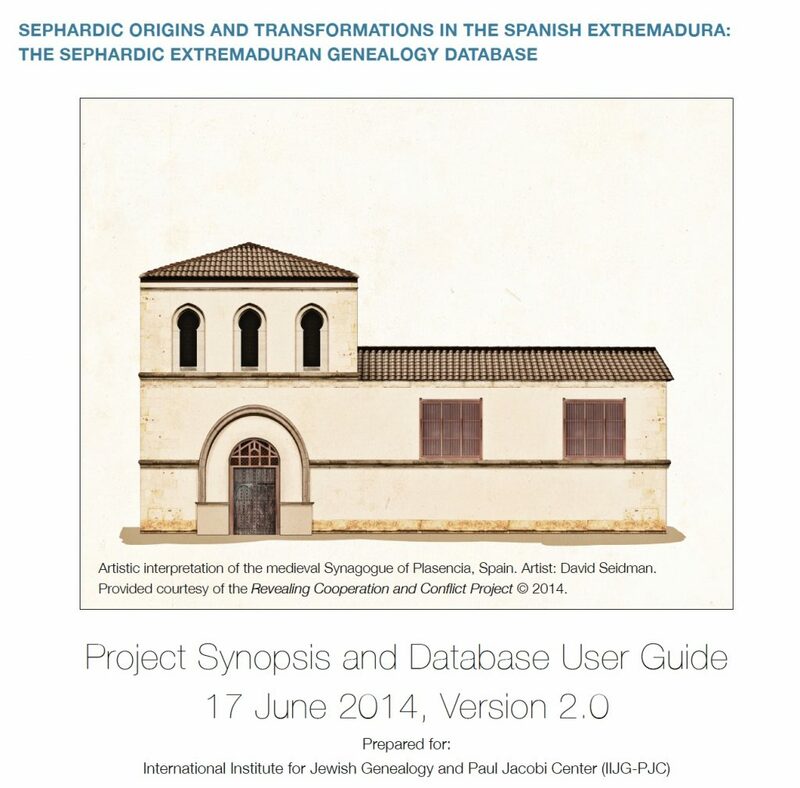 On 16 October 2011, the International Institute for Jewish Genealogy and Paul Jacobi Center (IIJG-PJC) funded the Sephardic Origins and Transformations in the Spanish Extremadura project that was conducted by Dr. Roger L. Martínez-Dávila. Over the course of two years, the researcher performed onsite archival, electronic, and text-based research on the late medieval Sephardic Jewish communities of the Spanish Extremadura. This research identified over 900 Jewish and converso (Jewish converts to Christianity) individuals who lived in-between the twelfth and eighteenth centuries of the common era. From this investigation, the researcher developed a genealogical database (a GEDCOM file) that was delivered to the IIJG-PJC on 17 June 2014. The Sephardic Extremaduran Genealogical Database is an electronic file that reports the personal and familial background for Jewish, converso, and a few Christian individuals (who were closed associated with Jewish and converso persons). The file, or database, is a standardized GEDCOM (GEnealogical Data COMmunications. GEDCOM) format. The database was created using RootsMagic 6 (a Windows OS software application). Textual review of printed primary and secondary sources. Due to reduced funding for the project, as well as Dr. Martínez being denied access to cathedral archives in Plasencia (Spain) and Coria (Spain) because of church staffing limitations, project research and findings were scaled back. However, the delivered database (17 June 2014) included over 900 persons of Jewish and converso status. In limited cases, Christians closely-associated with Jewish and converso persons were included in the database as well. The local Spanish institutions consulted onsite by Dr. Martinez included the Archivo Historico Municipal de Bejar, Museo Judio David Melul (Bejar, Spain), Archivo Historico Municipal de Coria, Archivo Historico Municipal de Ciudad Real, Archivo de la Catedral de Ciudad Real, Archivo Historico Municipal de Plasencia, Biblioteca del Seminario Mayor Diocesano de Plasencia, Archivo Historico Nacional (Madrid), and Archivo del Duque de Alba. Via the the Portal de Archivos Españoles, the following archives were consulted: Archivo General Simancas (AGS) – Valladolid, Archivo del Duque de Alba, Archivo de la Real Chancilleria de Valladolid, Archivo Historico Nacional (Madrid), and Archivo Historico Nacional-Sección Nobleza (Toledo). Dr. Martinez consulted multiple printed primary and secondary sources as well. Download and use the database as a GEDCOM file. Download and use the database as a RootsMagic 6 file. Dr. Jeffrey Malka, a genealogical adviser to the IIJG-PJC, presented the following questions to Dr. Roger Martinez regarding the processes of determining the religious status of persons in the database. This Q&A is offered to assist the genealogical researcher in understanding these crucial issues. Question 1: How were Jews identified in the database? You further mention in the synopsis that some Christians closely associated with Jews are included in the database. Was the Jewish identification solely based on their use of biblical first names? During that period not all Jews used biblical first names. Answer 1: As an archival historian, my primary concern is always to represent information from manuscripts and texts in accurate manner. As we can appreciate, humans who create records can be very inconsistent in the manner they note details. Again, as an archival historian, my approach is to err on the side of caution, expose ambiguity, and allow the records to speak for themselves. As much as possible, I attempt to report the evidence and separate my own assumptions and conclusions from this evidence. The beauty, and horror, of Spanish records during the Middle Ages is their single-mindedness when it comes to naming individuals in original manuscripts. Specifically, if someone is not a Christian (cristiano/a), then the original record will 9 times out of 10 state the religious status of the person. It’s quite amazing to see the records in this respect because they will state — “Yucef Abentaf judio” or “Yucef Rahman moro” — or “Jew” or “Moor”. So, I have taken no liberties in assigning religious statuses to persons in this database. In this same respect, this explains the variability in naming conventions for religious status. At times, records will state “judio converso” or “cristiano nuevo” or “converso” — all of which are synonymous. Instead of choosing a standardized convention, which is a form of invasive scholarly interpretation, in this database I report the term that is used in the original record. I think this is the safest approach to the data. Now, in this database in some cases I’ve translated the Castilian Spanish term “Judio” into the English term “Jew”. None of the persons in this database was identified as “Jew” or any other religious status based on a given name or surname. As we both can appreciate, Semitic names could easily be Jewish, Muslim, or perhaps, some other sub-religious identification (“Sufi”) that was used during the time period. Question 2: What percentage had the identifier judio added after their name? What percentage did not? Answer 2: About 9 out of 10 original manuscripts will name a person’s religious status if they are not Christian. Thus, this explains another nuance of the database. In some cases an archival record will name “Yucef” as a “judio” and then proceed to list his wife “Sara” and perhaps his son “Abraham”. As I approach the data with extreme caution, in the database I only report that Yucef was Jewish, even though the record states he was married to Sara and had a son named Abraham. Using this hypothetical example, if you were to consult the database you would find that Sara and Abraham either report no religious identification or it is unknown. I do think it is a reasonable assumption to believe Sara and Abraham were both Jewish, however, the original record does not state that information. Therefore, in the database, I leave the interpretation of the record up to the user. Question 3: What criteria was used to determine an individual was a New Christian (converso)? Was it always indicated in the source document? Answer 3: Regarding conversos and New Christians, I have only used those terms and other religious identifications when they are noted in the original document. As this database does not offer explicit scholarly arguments and present distinct assumptions, I do not assign any religious identities in this database. Question 4: You state “In limited cases, Christians closely-associated with Jewish and converso persons were included in the database as well”. Why were non-converso Christians included in a database of Jewish individuals? Are these clearly identified as such? Should they be included at all? Their inclusion would only misinform a curious IIJG visitor seeking evidence of Jewish ancestry. Answer 4: Wonderful question about including Christians. They represent a minuscule minority of the entire database population. In most cases, I’ve included them because the record does not state they are “conversos“, but I have a strong suspicion that they may either be (1) conversos who are hiding their identities or (2) they are Christians who are conducting business with and have strong social relationships with Jews. So, in the database’s notes field one will encounter more details regarding how these Christians are connected to the known Jewish parties. For the genealogical researcher, these so-called Christians are often missing links to understanding and documenting an extended family that is Jewish or converso. To be cautious, I’ve recorded these persons as Christians per the records, but I want genealogical researchers to be aware of them. Question 5: In my prior comments I noted some inconsistency in the terms used for the notation of “Religion” in the database. Sometimes it is listed as judio, sometimes as Jew, and sometimes as Jewish, etc. Similarly for converso or New Christian. I suggested that although these may be synonyms, unless there is a special reason for using different terms, it would be better to pick one term and use it consistently. Otherwise the reader might assume there is some reason for the difference that has not been explained. Being on the road I have not been able to check the latest database. Has this inconsistent use of terms been resolved? Answer 5: Regarding inconsistency in the use of religious identifications such as “converso“, “judio converso“, “nuevo cristiano“, etc. As stated in my reply to Question 1, the inconsistency is a reflection of the original records. Again, I am not comfortable as a researcher to standardized terms. As we can all appreciate — word choice is incredibly powerful. For example, I do think the absence of the use of the word “marrano“, a very derogatory term for a convert, is a revealing finding from my research and I plan to write on this point. Also, I do think there is a reason why different terms are being used in different documents — it may be an indication of social and religious proximity to Christianity. For example, a careful analysis of a record within a broader context might indicate that “converso” was used to describe someone that was clearly a sincere convert to Christianity, whereas “judio converso” might have been used to remind everyone that “Jose” used to be Jewish. Again, I am reluctant to standardized terms because that would force my assumptions into the database and from my perspective that would be problematic. Question 6: In my experience it was rare for conversos to retain their Jewish surnames and sometimes one comes across a document listing conversions with the name changes. Was such a list of conversos found that identified their name changes? A table or list of the non-Jews (conversos) would be useful to have as well as the relative numbers of Jews, conversos, and Christians in the database. Answer 6: Yes, we need this Rosetta Stone of surname changes from Judaism to Christianity. With the types of documents I work with (mostly transactional documents detailing property sales or conflicts, etc. ), these sort of lists are not created. They are not relevant to the transaction, so they are not created. Only in a very, very small minority of documents will the former Jewish name and the new converso name be utilized by the notary. Why? Precisely, because the conversos are trying to obscure their past. For example, in the case of the Ha-Levi family of Burgos and Plasencia, over the course of five generations the name changes from (1st gen) “Ha-Levi” to (2nd gen) “Santa Maria” or “Cartagena” or “Burgos” or “Garcia”, (3rd gen) “Santa Maria” or “Maluenda” or “Garcia”, (4th gen) “Fernandez” or “Calleja”, and (5th gen) “Cabreros”. Now, this type of revelation is not a standard finding in the database because it involves intensive investigation of many documents from many different places. However, I will write about this type of name transformation in a forthcoming scholarly article. Yes, a table or list of non-Jews would be useful, but ultimately it defeats my purpose of helping genealogical researchers to move past reading documents on a purely mechanical basis. Ideally, I want researchers to view those Christians as possible genealogical links and not to rule them out automatically. Question 7: During that period, name variations were common, usually consisting of name translations often within the same legal document. For example, abenmelec (Hebrew) becomes aben rey (Castilian), aben maleque (Arabic), etc. Was this noticed in this study and how was it handled? Answer 7: Regarding given and surnames, the database reports names as they are recorded in the original record, hence, the significant variability in spellings. Again, I am reluctant in the database to assign and choose “preferred” spellings because it gives genealogical researchers the false impression that names were spelled in standardized ways. This is especially the case with Semitic names where Castilian notaries were literally “writing out the sounds” they were hearing. Dr. Malka thank you so much for these questions. I certainly don’t think there is only one way to approach the issues we are discussing. My approach is “an approach” — and not — “the approach”.